No matter how much heavy training you put in at the gym, without the right nutrition you will not see the results. You need to eat to grow your body - and to grow extremely fast you need a high-dose weight gainer to supplement the essential proteins and carbohydrates. Ultra Mass gives your body exactly what it needs. What would the ultimate mass gainer look like? To start with, it has to be a chunk of calories with the ideal protein-carbohydrate ratio. Then, you want the smallest amount of sugar and very little saturated fat. 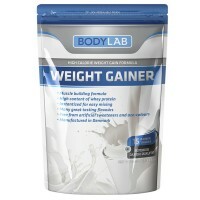 The mass gainer has to be capable of increasing your body weight by a minimum of 5-6 kg per month. There are hundreds of mass gainers on the market, but how many do you know of that will match the above profile? If you are looking for the ultimate mass gainer you have found it: Ultra Mass. There simply is no better product. Growth through an optimum protein-carbohydrate ratio. Growth through 20 grams of protein per serving. Growth through a protein blend consisting of WPI, WPC, MC and MPI. Growth through 520 calories per serving. Proteins are the building blocks of our bodies. Ultra Mass only contains proteins with a high biological value, no wheat or soy proteins. 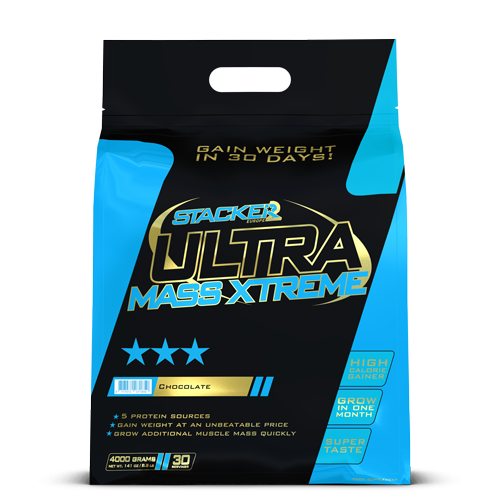 Ultra Mass contains whey protein isolate and whey protein concentrate for rapid absorption, and a combination of milk protein isolate and calcium caseinate for sustained release of, among other substances, glutamine. Ultra Mass does not contain any sugar but a combination of glucose, maltodextrine and fructose which ensures gradual release in your body. A serving of Ultra Mass contains 8 essential amino acids, including nearly 10 g of BCAAs (muscle growth and recovery) and more than 7 g of Glutamine. Which explains why Ultra mass work so well! Ultra Mass contains absolutely no ingredients that don’t belong in a mass gainer, so no creatine, caffeine, hormones or aspartame. Ultra Mass is safe to use every day, 365 days a year. If you want to give your body the very best mass gainer: choose Ultra Mass. Protein Blend (Whey Protein Isolates, Whey Protein Concentrate, Calcium Caseinate, Milk Protein Isolate), Dextrose, Maltodextrine, Fructose, Flavors, medium chain Triglycerides (coconutoil), natural and artificial flavors, tricalcium Phosphate. 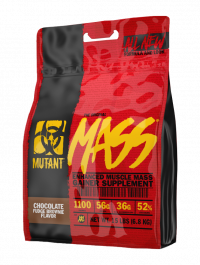 The NEW and IMPROVED Mutant's Mutant MassA product for weight gain intended for the hardworking athlete who wants to gain lean, fat-free muscle mass. 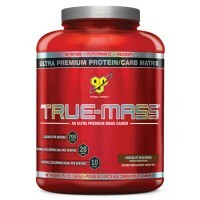 TRUE-MASS® is a mass gainer exclusively designed to promote muscle growthIt features BSN®’s signature ultra-premium formula based on the mix of complex carbohydrates and multi-component protein of high biological value. 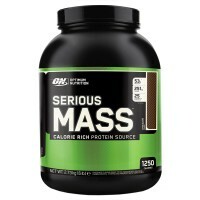 Optimum Nutrition's Serious Mass is a gainer containing large amounts of caloriesIt has been developed for those who have problems when it comes to gaining weight. 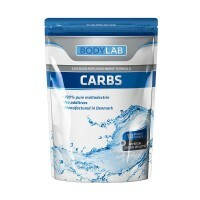 Bodylab Weight Gainer består af en kombination af både langsomt og hurtigt optagelige kulhydrater samt protein. Kulhydraterne kommer fra maltodextrin og sucrose. Proteinkilden er 100 % rent valleprotein (whey). Stacker2 is the world’s fastest fat burner, available now at GymNordic. Get their most popular products including Stacker 2 Extreme Energy Shots and Yellow Hornet. Stacker 2 is a worldwide line of diet and energy supplements that amplify weight loss, weight gain and weight management. Choose from their lines of Not Just Protein, Not Just Weight Gainer, Not Just Protein (Pro Series), Not Just Protein Isolate (Pro Series), and Not Just Casein Protein (Pro Series). For the best in sports nutrition and diet products choose Stacker2.